St. Francis of Assisi Middle School Teacher named NBC’s Inspirational Teacher! San Diego County Office of Education in partnership with NBC 7 San Diego selected Ms. Jennifer Segura, Middle School teacher at St. Francis of Assisi School, as the Inspirational Teacher of the Month. 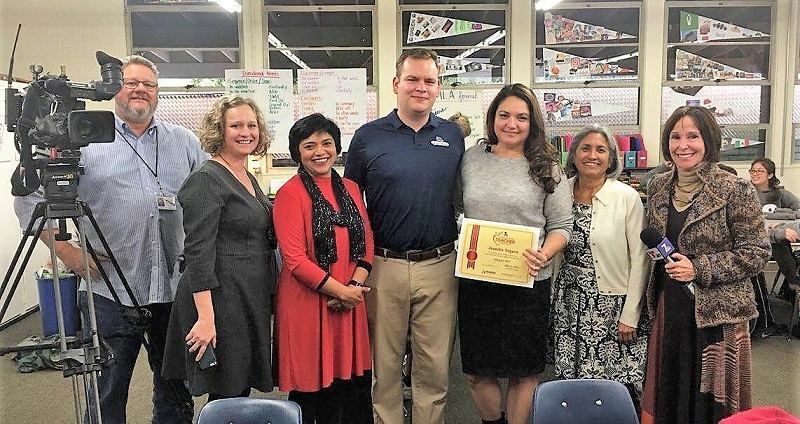 It was a very exciting day for St. Francis School when NBC education reporter Rory Devine, a cameraman, and a representative from SDCOE surprised her in her classroom with the award. School administrators, students, her mother and her son were there to witness this awesome moment! This is truly a well-deserved award. She is a phenomenal teacher who is extremely dedicated to the school and her students. She goes out of her way, gives up her lunch hour to build relationships and mentor her students. We have students coming from many difficult situations and she makes her classroom a safe haven for every one of the students. We are proud of her and congratulate her on his great award! Do you know where your food comes from? St. Rose of Lima students do. Handwriting in the Era of Tech? © 2019 San Diego Catholic Schools & Imperial Valley Catholic Schools. Schedule a tour at any nearby Catholic School.